*Sexuality:Kagi has never shown romantic interest in anyone too shy, and too involved in finding out the truths around the Hybrids to worry about romance at the moment....but that doesn't mean when the right person comes along he'll ignore true love when it happens upon him. Distinguishing Marks:Other then the 'VKA-1 engraved into his right shoulder he has no other markings tattoo's or piercings. Kagi has no scars.....except for natural birth marks on his buttock's hip area. several Amethyst stars crest the side of his hips level with his backside. Type of Build/Body:Small lean and agile he is built for speed and agility. Distinguishing Marks:Kagi doesn't shrink in size nor does he gain size he stays about the same size when he takes his true form. He is a solid snow white wolf with a shimmering amethyst purple tint to his fur, the tint coming to stronger hues anywhere the fur collects together to form points. Over the backs of his ears and at the tips are covered in deep dark amethyst. Small black nails at the end of his paws long tails off of his back side, four of them the same number of stars that sit on the side of his hindquarters in amethyst. 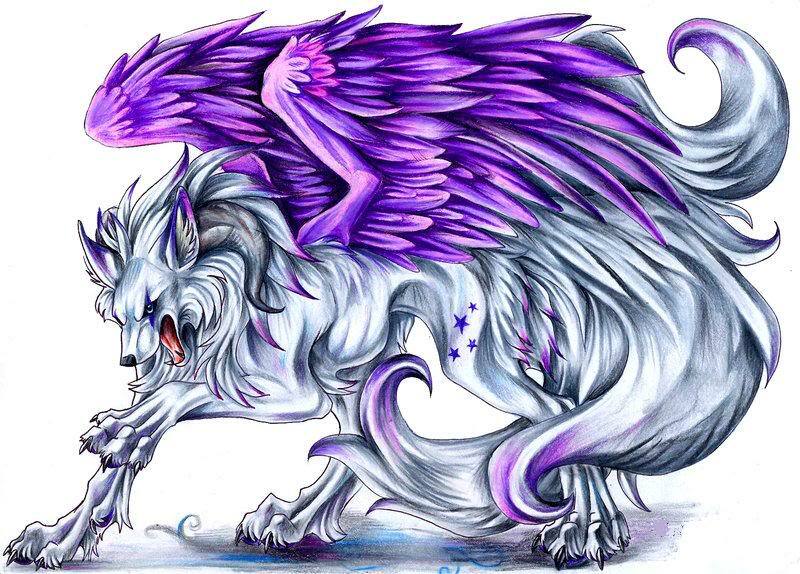 Off of the backs of his shoulder blades are large amethyst purple feathered wings allowing the fox great feets of flight. At his eyes are amethyst streaks seeming to going straight through them. Attitude/Personality:Kagi is soft spoken often taken to be extremely cold serious and uncaring, never seeming to smile or even have fun. The truth could not be more far off. Kagi is really just very shy, and timid around people he does not know, which is basically everyone outside of the hybrids. It takes a while for Kagi to warm up to a person he tends to remain remote and distant watching from a distance and afraid to trust them. He's always attempting to please the others working hard to get what needs to be done; done. He's very quiet and doesn't joke around often or get overly close to many people because of that he's considered rude and snobbish. Because of his serious issues with trust he has a hard time displaying outwards signs of emotion or deep affection towards others but if one can take the time to get past his hard exterior shell they'll find a very warm gentle and easily broken loving young man at the core with a heart of gold. Description: A five foot four tailed snow white fox with natural purple amethyst tinted fur. Kagirinai has angel feathered wings coming off of his back at the shoulder blades in deep amethyst purple. His long thick furred tails end in amethyst. Each of his paws are ended in black claws. His ears are tipped in amethyst and his hindquarters each have four amethyst stars on them. He has an amethyst streak through each of his eyes making them stand out a bit more in this state. He is a maned white fox the thick white fur coming up between his ears and down to his back. The fur thick on his hindquarters and down his tails as well. Coded D.N.A 4- Not Available/Used.. Powers Gained from the Unique combination of genes that created you. Supernatural Condition-Users are glaringly, obviously and super/unnaturally superior over their race because their capabilities are pushed to the superhuman level; making them immensely stronger, faster, durable and smarter than normal members of their species (in that 'verse) can achieve by any method of training and remain that way with little or no maintaining. Night Vision-the user has the ability to see at night without restirctions or handicaps as if it was solid daytime. Regenerative Healing Factor-the user is able to rapidly heal most wounds instantly if they are not instantly killed by the attack. Kitsune/Fox-User with this ability either is or can transform into an kitsune, a fox-spirit, who usually gain their powers by living long and keep growing stronger as they age: the more tails a kitsune has (they may have as many as nine) the older, wiser, and more powerful it is. They are often tricksters, with motives that vary from mischief to malevolence, but some act as faithful guardians, friends, lovers, and even wives. Canine Physiology-User with this ability either is or can mimic/transform into canines, including wolves, foxes, jackals, coyotes, and domestic dogs. Enhanced Bite-The user has particularly strong bite, either because of sharp teeth, strong jaw-muscles, unusual jaw-structure (mandibles of insects, beak, etc.) or some other reason. Exactly what they can bite depends of the jaw-strength, resilience of their teeth/bite-surface and their shape. Environmental Adaptation-User is able to survive and adapt to any natural environment, being able to tolerate wide range of temperatures and levels of moisture, any amount/quality of sustenance, breathable medium, etc. with little or no discomfort. Desert Adaptation: allows the user to go longer without water or food and to use it more efficiently, body which deals better with heat, and perhaps coloration close to the color of the desert environment. Vacuum Adaptation: allows the user to survive in space unaided, to withstand atmospheres (the friction, intense heat and any poisonous chemical elements) and cosmic radiation, and to maneuver more easily in strange gravity. Predator Instinct-The user possesses predatory instincts, allowing them to become masters of hunting and tracking. One with this ability can discern numerous factors of a situation that make them a master of pursuit and capture. This includes what move a foe will make, where they are headed (if the user is in the foe’s proximity, or knows the foe fairly well), as well as how to effectively cause a foe to play right into one’s hands in combat/pursuit. Temperature Regulation- The user can maintain different levels of their own body temperature for extended periods of time, if not, indefinitely. Some users may even be able to manipulate their own body temperatures at will. Claw Retraction-The user can project and retract razor-sharp claws from their fingertips for offensive purposes. Claws can be composed of energy, bone, metal, or simple keratin. Note Kagi has his claws in both states. Dream Manipulation-User can create, shape, enter and manipulate the dreams of oneself and others, including modifying, suppressing, fabricating, influencing, manifesting, sensing, and observing dreams as well as nightmares, daydreams, etc. They can produce and modify dreams, bestow nightmares or lucid dreaming, entrap people in REM, and promote spiritual/emotional healing within dreams. In some cases, the user's power extends to the real world, such as wounds inflicted on a sleeping victim and even pulling someone from the waking world into the dream world. Fox-Fire Manipulation-User is able to generate and manipulate fox-fire which usually manifests as fire, electricity and/or light. Kitsune who are the main users of this power usually expel it from their mouth or tails. Certain users may be able to use fox-fire for additional purposes, including hypnosis, draining life-force or even souls or as a form of travel, either by riding the fox-fire or changing into/becoming it. Illusion Manipulation-User can create, shape and manipulate illusions, causing targets to see, hear, touch, smell and/or taste things which do not actually exist or cause them to perceive things differently from what they truly are. Some users can create complex and detailed worlds, others may be able to only alter the way they or the target are perceived. Insanity Inducement-Kagi can produce Willo-whisps that in the end can cause a person to loose there mind following illusions and fantasies endlessly and becoming lost. Breaking them and making them go insane before the hour is out the moment they spot the small fiery balls of light. Life-Force Absorption- Although it is not a skill set that Kagi likes to use the one time in the past he had about to break he found he could do it. He had been about to break when he left the warehouse and someone attacked him instead of healing him, he instead inverted his healing powers and drew out of him the man's very life force and energy absorbing it and making it his own. He has sworn to never use this skill again unless he absolutely has to and has no other choice. Possession-User has the ability to take over another mind and body without fully entering them making them obey as if they were a puppet on strings and dance for them obeying there commands as a silent voice whispering in the back of there mind. Shapeshifting-Kagi has the ability to become other things at will wither that is another animal person or even item, it lasts as long as he has the strength to make it last or until he's made to break the shift and revert back to normal. Tail Manifestation -Besides Sora, Aoi is the only one that knows the true Number of tails Kagi holds and that is nine tails. Born/created with nine tails since the moment that Kagi came into the world Kagirinai choose instead to only show off four of them allowing those around him to always believe that he is much weaker then he truly is. Curse Inducement-Kagi is a true Kitsune he can curse someone casting an unbreakable curse on those who have wronged him. On not only them but there entire family line any who share even the smallest trace of there blood. He doesn't need anything of the person to cast the curse just to know what there life force feels like. Invisibility- Kagi can become invisible with a bit of focus on his part seeming to have left the room or area when he hasn't moved at all only those with a keen sense of smell would know he's still in the room. Plant Manipulation- Kagi can control plants turning even the most beautiful of flowers into a dangerous weapon or making a harmless flytrap into a man-eating demon flower at will he can change them there size shape everything about them causing them to grow with nothing but his energy from a seed. Prehensile Tail- He can use his tails to fight but like his hair he finds it lacks taste. The hair on his tail can become razor sharp cutting into those he's fighting or stabbing them quickly enough although he hates doing it as cleaning his tail is a real pain. Supernatural Beauty-Kagi has the sort of beauty that makes men and women trip over themselves when he walks in the room to help him he could have them rob a bank for him do anything for him as if his aura and his body give of a pheromone that just makes others loose there minds with there desire to help him to have him if even for a moment. Even after that when he leaves whatever they have done for him if so enchanted by him is forgotten by them shortly after it is done. More often then not they could give up a few prime pints of blood to him and never remember him or even offering just that they feel absolutely great for a while and can't for the life of them remember why. Angelic- User with this ability either is or can transform into an Angel, a being connected and serving Higher Powers. Most commonly user simply manifests wings, inner glow and/or a halo, which is the usual form angels are imagined, but there are several kinds of angels who are far less humanoid, some ranging from strange to surreal. Spiritual Angels are completely spiritual beings, and thus far less bound to the laws of physics or single form. Many of them think in ways that are only tangentially relatable to humans, and their forms are both transient and often downright surreal. Healing-User can restore biotic organisms to their optimal health, curing damaged or withered organisms, wounds, broken bones, low vitality, and diseases/poisoning. Though the user may potentially heal any form of bodily damage, the patient must be alive, even if hanging by a thin thread, in order to be healed; once the patient has died, it would transcend healing and would require resurrection instead. Health Optimization-Users can identify any foreign objects and impurities in others' bodies, such as radiation, narcotics, viruses and diseases, etc. from anything living, including themselves, and heal the patient into optimum condition. Impurity Sense: ability to sense foreign objects and impurities in others' bodies, such as radiation, narcotics, viruses and diseases. Internal Bodily Cleansing: ability to "cure" foreign substances from others' bodies. Power Erasure: ability to remove the abilities of others who have gained said abilities through mutation or drugs. Holy Fire Manipulation -The user can create, shape and manipulate holy flames, which are especially effective against evil and demons and are inextinguishable by normal means. It may also trap and/or immobilize angels or demons, rather than killing them outright. The color of the flames varies, but usually blue, white, or the normal if light shades of fire. Some flames can have different properties and abilities such as summoning spirits of the deceased back to the world of living. Very strong or high level users could obtain or gain the ability of Resurrection via Summoning the deceased and/or Angels from Heaven. Redemption -The user can remove the darkness or evil from a person or objects, often including demons possessing it or mind control affecting it. It can turn evil to good or merely make someone pure. History:The exact date they created him was lost they had misfiled that paper work and a lot of other paperwork when it came to him or rather is it because there was never a him at the time Kagirinai was there in the labs but a her? No one can say for sure but he or she followed them leaving the labs behind and entering into the world running along with them. One of the smallest of there number and upon getting to the warehouse and after loosing Natami, Kagi worked hard to catch any of there number that began to break down and worked to heal them bringing them back to prime health over and over again. But there is only so many times that would work and Aoi often would bring those to him that were thought to be beyond saving by anyone else for Kagi truly had an angel's healing touch able to reach deep and heal unlike any other out there and so he kept most of there group alive for almost two years and at the end of two years they lost forty of them. Kagi was simply unable to keep them any longer unable to save them as he didn't have the strength to keep pushing it back when it kept coming faster and faster they just simply weren't meant to be, but instead of letting them become lost completely Sora did what none of them had the strength to do he went in there alone and faced all forty. He fought them and came out badly scared he fought them one by one taking on there pain into his own body the great three headed tiger carrying there cries of pain for having to leave this world and them for dying as there bodies and minds betrayed them and his body carried the burdens of those scars....Kagi healed them but the wounds were made by the black claws of Hybrids and unlike any other wound out there even with there advanced healing it scared. Kagi laid a hand on the now sleeping tiger knowing that even if he didn't show and never would he'd cry for them. For all of there losses as he was unable to save them. 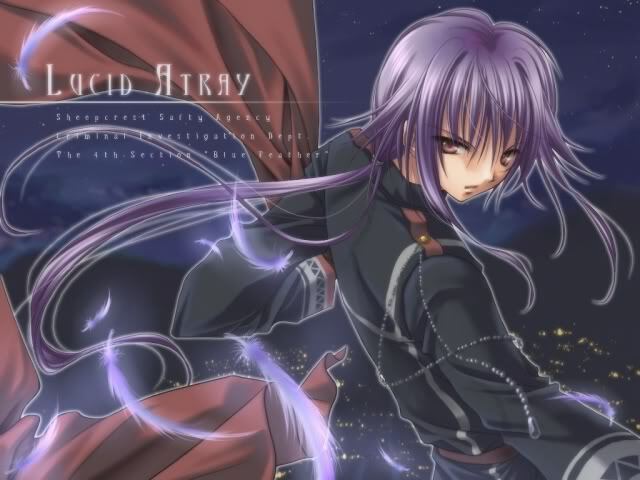 It was said that one time he once Carried Aoi's soul and died to give it back to the now Vampire king to save him and to give a gift to the Vampire king Sora who Aoi carried back to them dead covered in his own blood and Aoi's gone...not just dead but gone no trace of any life having ever been in that body and they took him from Aoi laying him down on the ground everyone then had yelled at him to save Sora and all he could do was shake his head there was nothing to save he could fix the damaged body easily but the soul that lit those eyes was gone forever. And when he looked into Aoi's he knew the sad vampire knew why and it was killing him inside. Kagi didn't often show affection but today knowing the pain this tiger now carried the scars that littered his back his arms and legs were the scars the bites and claws of there friends not fighting to live but fighting to force Sora to kill them as he tried to calm them....tried to reach them....they attacked him and made him fight back....before they were completely gone. Sora would forever carry there burden scared into his body and Kagi curled into the tiger's side he wasn't Kira but he was angelic so he sang for the tiger right now watching as his troubled sleep calmed. Tonight he'd chase the nightmares of the burden he was made to carry away. Tomorrow they'd face another day and let Aoi know what happened. Let him know Sora needed a stronger shoulder then there's to cry on because as there king he had to make a terrible choice but in the end he made it and gave them all peace and that was what he told Sora with this song....he sang there song there last song of there souls going to heaven to rest in peace thanks to him. To him taking away there pain and torment of a body destroying them with every breathe they took. This was the long lonely road of a king...and unlike Aoi Sora had no lovely phoenix to stay by his side. He had no great lover to support him even when they had there ups and downs someone the dragon and phoenix always came back to each other but there Sora carried his burdens alone. It was a good thing he was such a massive tiger and had such large shoulders if he was a small little fox like Kagi....would he break under the weight? Would a Queen topple under the weight of her people if they needed her? These were all thoughts that Kagi thought about daily as she watched her beloved friends struggle with things every day. But right now she watched Sora struggle under the weight of his sorrow and then looked up they had freed Kira who was at home sleeping and up walked Neikan not Aoi. Aoi was needed with Kira but Neikan not normally known for his gentleness walked up to the sleep hurting tiger and slipped in next to his massive heads did something and moment's later he was holding the smaller man which he lifted up and then smiled that everything will be alright smile of his and walked off cradling Sora. It was then that Kagi realized Sora wasn't a lonely king Aoi was aware when his precious tiger needed him and if he couldn't be there would ask Neikan who Sora was fond of to come and keep the tiger company in his stead. And Neikan did easily cradling the slumbering blue haired king as he walked to Sora's chambers now that the others had taken away there fallen friends and taken Sora to rest just hold him and rest. 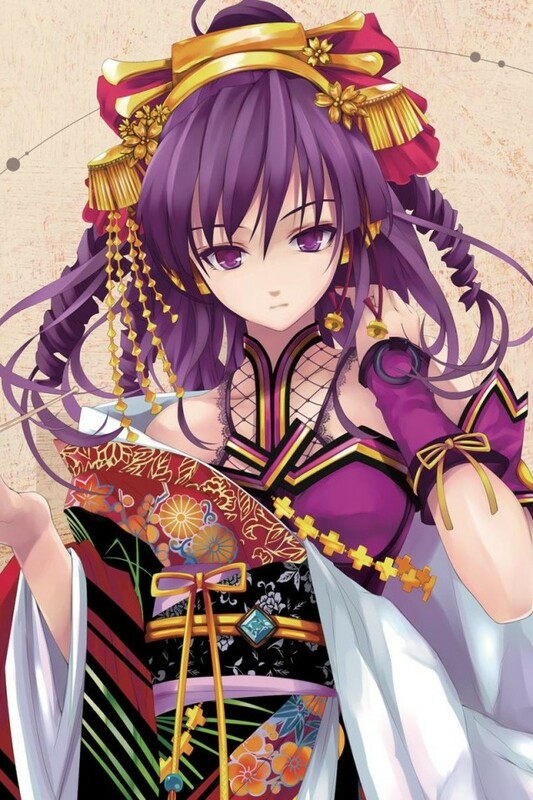 Kagirinai has spent his time searching for any information on the Kitsune he knows so far he can mimic there abilities or is it that he is the only one in existence now? He's not sure since no matter where he searches in Japan there seems to be no trace of the creatures anymore it seems like he is the only Kitsune left and if that is the case he is not even a true Kitsune but a replication and a sad one at that perhaps if he is a replication of the once proud and noble creatures he can do something about bringing them back and yet he will not abandon Sorairo and the other three right now he is needed here with them and he will help them until the end.